As a whole, the Global Project aims to take all steps towards the adoption of LNG as marine fuel in the Eastern Mediterranean, while making Greece an international marine bunkering and distribution hub for LNG in South Eastern Europe. The project’s commencement in the year 2014 was based on the results of COSTA I project, which prepared an LNG Masterplan for short sea shipping between the Mediterranean Sea and North Atlantic Ocean, as well as the Deep Sea cruising in the North Atlantic Ocean towards the peripheral and ultra-peripheral zones of Azores and the Madeira Island. Focusing on the Eastern Mediterranean coastline, 19 partner organizations and companies from 5 EU Member States (Cyprus, Greece, Italy, Croatia and Slovenia), joined forces in the framework of Poseidon Med (COSTA II East) in order to complete 8 activities that laid the foundations for a feasible and sustainable operating network for the supply, storage, distribution and bunkering of LNG fuel with its core located in the port of Piraeus. 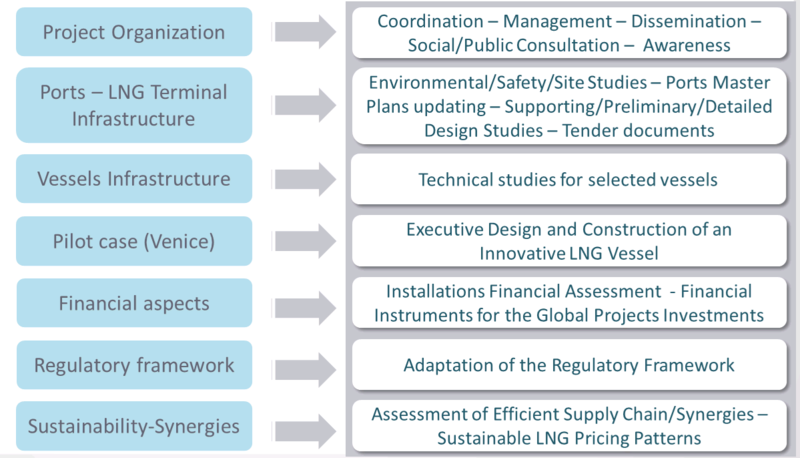 It included studies regarding: the LNG Network, Supply and Demand, Legislation and Regulatory Framework for the adoption of the LNG as fuel in Offshore and Onshore installations, LNG Infrastructure and Installations, Integrated Maritime Supply Chain for LNG, Risk Assessment, Sustainable Financing, Local Assessments of Northern Adriatic Ports, Management and Dissemination Activities. The successful progress and potential of the Poseidon Med project led to the initiation of Poseidon Med II in 2015, aiming at proceeding with enhanced technical and business studies covering ships, major ports, bunkering operations and LNG facilities, taking further steps towards the maturity and implementation of the principal scope. Poseidon Med II aims to contribute to reducing negative impacts of heavy fuel oil powering and to facilitate the implementation of the requirements of a number of EU Directives regarding alternative fuels for a sustainable future in the shipping industry. develop synergies with other sectors (mainly Energy) that will create economies of scale in the use of LNG.